Bringing existing houses up to a high standard of energy efficiency is a much greater challenge than with new ones. Extremely high insulation levels to all the external surfaces – approximately 200mm of insulation – mainly a special high grade of expanded polystyrene (Neopor) and also Warmcell and mineral fibre. Triple glazing to the windows. 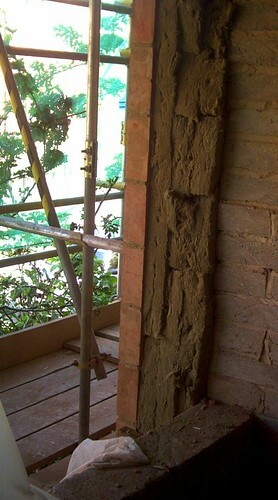 A very high level of air tightnessA measure of how leaky a building is to air. In other words, how draughty it might be. There are now standard fan pressure tests to check how air tight a house is and the Building Regulations have minimum standards for all new houses (L1A – Conservation of fuel and power in new dwellings (England)). A much higher degree of air tightness is covered by the Passivhaus standard using pro clima Solitex membrane. Over 5 kWkilowatt - a measure of how fast energy is flowing. e.g. electricity might flow through an electric kettle element at the rate of 2 kW (peak) of PV generation which will be attracting a good feed-in tariff. A Lenius wood pellet stove also feeding into this accumulator. Heat reclamation from the ventilation system, similar to the PassivhausSee more on the Passivhaus standard. The PassivHaus Institute has pioneered a standard for low energy buildings. It includes very low energy usage and ways of achieving this. The word is derived from the idea of buildings which are fundamentally low energy and passive solar heated rather than using extra gadgets to heat them. 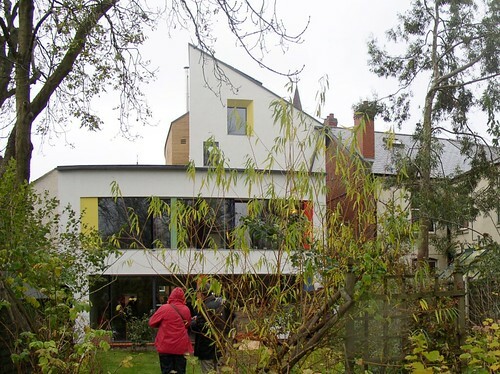 See Passivhaus for the UK branch of the organisation. model. Glazing is carefully positioned to get daylight down into the centre of the house and window openings have generous reveals so that the maximum of light, view and solar gain is achieved. The design work has been carried out by the owner, John Christophers of Associated Architects. The building was originally a fairly normal early Victorian house with brick walls and slate roof. It has now been imaginatively extended to the rear and upwards to the attic room which has good sound insulation from the rest of the house and fine views over the city. There is a new, gently curved stair well and interesting shuttered openings which interconnect rooms. Occasionally glass flooring has been used to further help natural light penetrate into the house. What is really interesting is the degree of care taken to remove cold bridgingthis is a pathway where heat can easily escape (or get in) through some part of the structure. It is usually caused by some element of structure such as a steel lintel or wooden studwork. Also known as a thermal bridge. 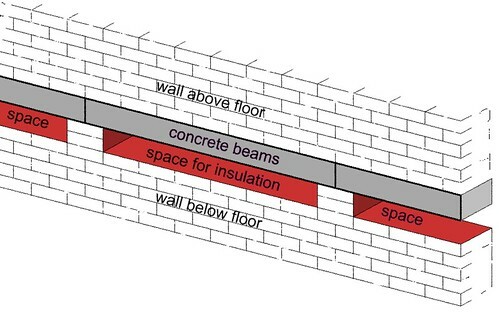 see more on cold bridging and to create air tightness. As some of the insulation has had to go on the insides of walls and some on the exterior it has meant isolating sections of structure from each other by cutting out slices and then inserting the insulation. TeploTies have been used as wall ties because of there low thermal conductivity. Windows generally have plywood liners. The breathing air tight membrane (Solitex) has likewise had to weave around parts of the structure in many places. This is especially true where the new extensions meet the old building.